• What is Organic Prairie Organic Beef? • What makes Organic Prairie’s beef organic? 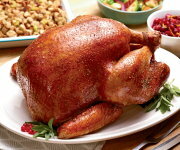 • Is organic meat safe? • What are the health benefits of eating Organic Prairie organic beef? • How does Organic Prairie manage animal health? • What is Individually Quick Frozen (IQF)? • Why are some Organic Prairie meats described as “uncured”? • What does it mean to say our beef “blooms” after the package is opened? • What is “high pressure processing? • Where is Organic Prairie organic beef produced? • What is the difference between “organic,” “natural,” and “grassfed” meat? • What does the “freeze by” date mean? • What is “essential” omega-3 fatty acid? • How can our diet provide essential omega-3 fatty acid? • Why do we need to balance our consumption of omega-3 and omega-6? • What’s the best ratio of omega-6 to omega-3 in your diet? • Why is the ratio of omega-3 to omega-6 more balanced in Organic Prairie Grass-fed 85/15 Ground Beef and Pasture-raised 85/15 Ground Beef? • What’s the difference between genetically engineered (GE) foods and genetically modified organism (GMO) foods? • How do I know which Organic Prairie products don’t have GMOs? • Why are Organic Valley dairy products labeled non GMO, but Organic Prairie meats are labeled no GE? 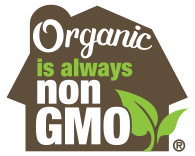 • Organic Prairie products do not have the Non-GMO Project seal – why not? What is Organic Prairie Organic Beef? Organic Prairie Organic Beef steaks, roasts, ground beef and hot dogs are made from 100% certified organic beef. Organic Prairie animals are raised on family farms, and never receive antibiotics, toxic pesticides, synthetic hormones, or genetically modified (GM) feed. What makes Organic Prairie’s beef organic? Organic animals consume only certified organic, vegetarian feeds and pasture and no animal byproducts. This is your best protection against bovine spongiform encephalopathy (BSE, or Mad Cow Disease). There is much more to food safety than on-farm practices. We go beyond the gate with our animals to ensure quality and safety. To ensure your safety, every batch of Organic Prairie meat is tested for harmful bacteria before it leaves our processing facilities. Organic Prairie tests for all seven E. Coli pathogenic strains in the raw materials used in our ground beef. Organic Prairie maintains meticulous records on every animal we raise and harvest, ensuring traceability from farm to table. We require annual third-party facility inspections for adherence to USDA Good Manufacturing Practices. Organic Prairie staff follows up on audits. What are the health benefits of eating Organic Prairie organic beef? Eating organic beef minimizes the risk of exposure to pesticides, growth hormones, and antibiotics, as well as the harmful bacteria that are more likely to be found in beef produced in confined animal feeding operations (CAFOs). Beef is an excellent source of protein and a good source of iron, zinc, selenium and B vitamins. People who eat beef regularly are more likely to meet 100% of the RDA for protein, iron, zinc, and B-vitamins. (USDA CSFII 1994-96). Beef contains stearic acid, a unique saturated fatty acid, which research suggests has either a neutral or cholesterol-lowering effect, in contrast to other saturated fatty acids found in meat. The greater the percentage of cattle’s diet that comes from grass, the more optimal the ratio of omega-6 and omega-3 fatty acids in the beef. How does Organic Prairie manage animal health? The foundation of Organic Prairie’s organic livestock production is maintaining strong, healthy animals with robust immune systems. Animal care on Organic Prairie farms is first and foremost preventive. Cattle are raised organically, without chemicals or antibiotics, and live in their natural environments as much as possible, which reduces stress. If an animal takes ill or is injured, holistic and natural remedies are used to treat the animal. Animals are never allowed to suffer—if the animal does not respond to holistic treatments, then antibiotics may be used, but that animal must be removed from the organic herd and may not be sold as organic. CROPP Cooperative / Organic Prairie provides the support of a Farm Resources Department staffed by some of the nation’s foremost experts in holistic animal husbandry and traditional and organic veterinary medicine, as well as a livestock nutritionist, animal care specialist and agronomist. Individually Quick Frozen (IQF) is the process of quickly freezing individual pieces of meat prior to packaging, which results in enhanced retention of flavor. Why are some Organic Prairie meats described as “uncured”? Organic Prairie uncured products are in effect “cured,” but with a curing process that uses the nitrates naturally present in celery juice, which have been converted to nitrites by use of a lactic acid starter culture. Nitrites, naturally occurring or synthetic, block the growth of dangerous bacteria in processed meats, and give “cured” meats their characteristic color, flavor and shelf life qualities. What does it mean to say our beef “blooms” after the package is opened? Our beef (except for the round tubes of ground meats) is vacuum-packed, meaning the air is removed from the package during the sealing process. The beef looks purple-ish because oxygen has been excluded. When the package is opened, oxygen in the air comes into contact with the meat, reacts with the myoglobin in the meat as a natural process, and turns the meat red. 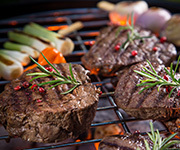 The Organic Standards of the National Organic Program prohibit the use of carbon monoxide in organic processing, which is what gives some non-organic meat its red color while in the package. Vacuum packaging provides a long shelf life without use of the carbon monoxide gas flush and is ideal for frozen storage of meats. What is “high pressure processing? High pressure processing (HPP) is a physical treatment that is USDA-approved for use in organic food processing. Cooked, packaged meats are placed in a water chamber where very high pressure is applied, killing residual bacteria without the use of high heat, chemicals, or irradiation. HPP extends shelf-life without compromising food safety in foods manufactured without use of chemical preservatives. HPP does not diminish flavor, texture, or nutritional content. Where is Organic Prairie organic beef produced? We source our regular organic beef from the farmer-owners of our cooperative in the United States. Organic Prairie Organic 100% Grassfed Beef products are sourced from our cooperative farmer-owners in Queensland, Australia. As the demand for organic grassfed beef grows, we are exploring domestic sources for organic grassfed beef to complement our Australian supply. What is the difference between “organic,” “natural,” and “grassfed” meat? It is a common misconception that “natural” or “grassfed” meat is the same thing as “organic” meat, but this is not the case. While organic foods are ALWAYS third-party certified to comply with strict, far-ranging USDA organic regulations, “Natural” foods are not. Learn more about the organic difference. Organic Prairie’s Organic 100% Grassfed Beef is first and foremost organic grassfed beef. All of Organic Prairie’s beef is pasture-raised if not strictly grassfed. Our 100% grassfed beef is fed only on mother’s milk as youngstock, and then on certified organic pasture and dried forages. What does the “freeze by” date mean? The “freeze by” date is the date by which it is safe to freeze a fresh meat product for later use. Once frozen meat is thawed, it should be used immediately for best results. What is “essential” omega-3 fatty acid? Omega-3 fatty acid is considered “essential” because our bodies cannot produce omega-3, so we rely on food sources for this vital fatty acid. At all stages of life, omega-3 fatty acid is required to ensure overall health and well-being. It plays a crucial role in brain and eye development and function, as well as cardiovascular health. How can our diet provide essential omega-3 fatty acid? Plants are full of omega-3 fatty acid, so meat from grass-fed animals contains more omega-3 than meat from animals that consume a grain-based diet. Organic production regulations require that a high percentage of cattle’s diet is grass-based, making organic meat higher in essential omega-3 fatty acid. Why do we need to balance our consumption of omega-3 and omega-6? Although omega-6 fatty acid is also an essential fatty acid, the overly-processed foods we eat today contain too much omega-6 fatty acid from vegetable oils and grain-fed cattle, and too few of the omega-3 essential fatty acid derived from the milk of grass-fed cows, oily fish, beans, fruits and vegetables. Scientists point to this imbalance in the modern western diet as one main cause of endemic inflammatory diseases such as cardiovascular disease, obesity, cancer, diabetes, neurological and immune system disorders, and visual impairment. What’s the best ratio of omega-6 to omega-3 in your diet? 1:1 is considered ideal, but 3:1 is very good. Today’s typical diet consisting of too much processed food and meat from animals that consume mostly grains and very little pasture grass create ratios of omega-6 to omega-3 as skewed as 20:1. Why is the ratio of omega-3 to omega-6 more balanced in Organic Prairie Grass-fed 85/15 Ground Beef and Pasture-raised 85/15 Ground Beef? It’s because of Organic Prairie farmers’ strict adherence to the National Organic Program (NOP) pasture regulations! ** When cattle are fed mostly pasture grasses and stored forage (greatly minimizing grain-feeding), omega-3 fatty acid levels rise and omega-6 decrease, producing the near-ideal omega-6:omega-3 balance in Organic Prairie 85/15 Ground Beef. 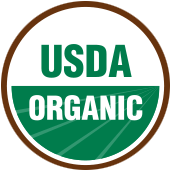 * USDA labeling policy does not currently allow omega-6/omega-3 ratio information on organic meat packaging. What’s the difference between genetically engineered (GE) foods and genetically modified organism (GMO) foods? Nothing. These terms are used interchangeably. How do I know which Organic Prairie products don’t have GMOs? The bottom line is that Organic = non-GMO. One of the many requirements for organic certification by the USDA National Organic Program (NOP) standards is: “USDA National Organic Program standards exclude the use of genetically engineered ingredients in organic production and processing.” So when you see the USDA Organic seal on the package, it already means non-GMO. Why are Organic Valley dairy products labeled non GMO, but Organic Prairie meats are labeled no GE? Dairy products are regulated by the Food and Drug Administration (FDA), which allows an array of terms, including No GMOs, No Genetically Engineered Ingredients, No bioengineered ingredients, and others. Meat products, on the other hand, are regulated by the United States Department of Agriculture (USDA), which requires pre-approval of meat labels, restricts producers to particular wording, and requires a longer claim referring to Genetically Engineered processes and ingredients. Organic Prairie products do not have the Non-GMO Project seal – why not? Our cooperative tests feed and seed for the presence of GMOs, and some of our products have even been enrolled, verified, and are eligible to use the Non-GMO Project seal. Our position, however, is that we can more effectively communicate to our consumers that Organic = No GMOs or GE through the language we put on all our packages: “USDA National Organic Program standards exclude the use of genetically engineered ingredients in organic production and processing.” This statement refers to the seeds used to grow the feed, the feeds used in the diets of the livestock, the animals themselves, and the non-meat ingredients used in the processing of our products. Choosing Certified Organic is the best way to make sure your food was produced without genetically modified or engineered organisms.